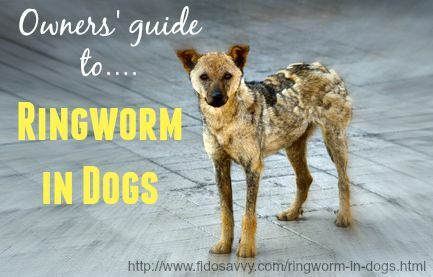 Ringworm in dogs is not caused by worms but by a fungus, which makes it a fungal infection rather than a parasitic one. 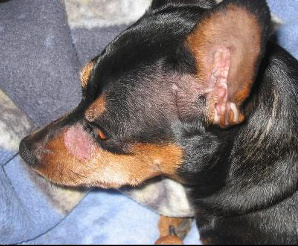 The fungi involved are called Dermatophytes and in dogs there are three different strains which can cause ringworm. These same strains can also cause fungal infections in people, including Ringworm, Athletes Foot and Moccasin Foot. Roundworm is a very contagious 'zoonotic' condition (which means that it can be transmitted from one species to another, including from dogs to humans). These fungi 'feed' off the keratin which is in skin, nails and hair. Although ringworm is most common in cats, many different animals can catch it, including dogs, cats, humans, horses and cows. It's most common in young animals... puppies, kittens, calves and foals... but can happen at any age. Ringworm in dogs is generally self-limiting, in other words it eventually clears up by itself withing a few months, even if it's not treated. BUT, it can be very uncomfortable, and unsightly, and because it's highly contagious the longer Fido has Ringworm the more pets/people are at risk of being infected. It's the fungal spores which spread the infection, and they can be transmitted either by direct skin-to-skin contact, or by coming in contact with anything which has been contaminated by those spores. Bedding, clothes, toys, clothes, dishes, furniture, carpets, hard flooring, soil.... just about any surface can harbor these spores which is why it's so infectious. There is at least one part of this conditions' name which is correct - the 'ring' part! 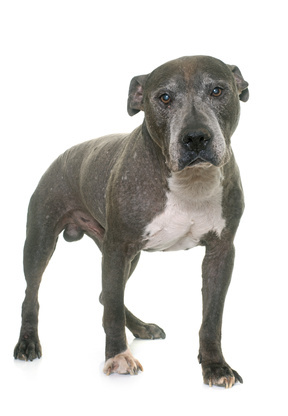 The most common signs of ringworm in dogs is the development of circular scaly, bald spots. Most dogs start off with just a single lesion and sometimes this isn't noticed or is ignored. Not every dog will show exactly the same type of skin lesion, and as the disease progresses the look of the irritation will change and it will spread. The skin where the hair has been lost may be pink, reddened, scaly, crusty or irritated. It can also be itchy. Often the outer edge of the circle will show the most irritation, scaling or crusting and the center will be more paler and smoother, but sometimes the center of these areas will look red and/or irritated. The fungal spores actually live in the hair follicle (which is right at the root), this causes individual hairs to thin, break or fall out completely, forming the characteristic bald spots. 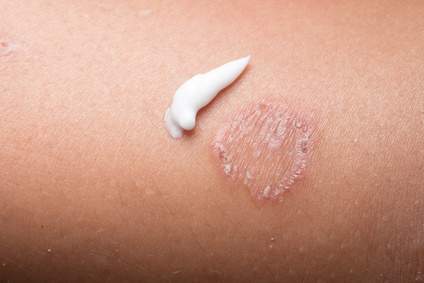 If the patches are unevenly shaped, either Ringworm is not to blame, or you're seeing where two or more lesions have joined together. Sometimes the fungus will affect a dogs nails and they become brittle, broken and/or discolored. The incubation period for ringworm in dogs is approximately 10 days. This means that it will be about 10 days from the contact with the fungus before Fido will show symptoms. These lesions/patches usually appear first on your dogs' head, ears, tummy, tail, paws or on his sides - however they can show up just about anywhere. If the condition isn't diagnosed and treated, these patches can become very widespread, even covering your dogs' entire body. Any dog can catch ringworm, but young puppies and dogs whose immune system is weakened by age, illness or stress, are most susceptible. Ringworm is a common cause of hair loss in puppies. As with many other dog illnesses and conditions, some puppies or dogs will catch Ringworm without developing any symptoms. They will still be contagious and are 'carriers' of this condition. Often a veterinarian can diagnose Ringworm in dogs simply by a physical examination. But to be sure there are tests which can be done to verify that visual diagnosis. These include looking at your dogs skin using an ultra-violet light source called a 'Woods' Lamp', or by performing certain tests on your dogs' hair. The Woods Lamp only shows a positive diagnosis for the M. Canis spores (the fungus will glow a bright green), but even then it's only accurate about 50% of the time. A false-negative result is very real possibility. If your dog is infected with one of the other strains he'll also test negative with the Woods Lamp. Because of this, other tests are usually recommended. These involve laboratory testing of hair samples, but the results can take anywhere from one to two weeks, so treatment is often started anyway if your veterinarian is confident that Ringworm is causing your dogs' symptoms. Your dog is contagious while he has an active infection (and can still be contagious for some time after symptoms disappear). Ringworm treatment for dogs includes a number of oral, or topical, medications. There are also natural and home-remedies which can be used if you prefer to try that route first. With the correct treatment given promptly you can expect the ringworm on your dog to be contagious for about three weeks. If you didn't finish the medication or weren't careful about applying/dosing your dog chances are the fungus won't be totally eradicated and Fido willl continue to be contagious. A few weeks after treatment has started your vet will want to run tests to see if the infection has been eradicated. Often two tests, given a week or so apart are needed to be sure. It's best to keep your away from other dogs for several weeks once he's been diagnosed with Ringworm and treatment has been started. Because ringworm in dogs is so easily transmitted, it's very important to make sure that you're thoroughly sanitize all the possible places which could be harboring fungal spores. A 1:10 solution of bleach and water will kill the spores and can be used to clean toys, bowls, hard flooring and surfaces, cement, brick and so on. Obviously it's also really important to rinse carefully anything that might come in contact with your dogs' mouth. A Chlorhexidine Disinfectant is also effective used as an all-purpose cleaner. Soft toys, bedding and clothing should be washed on the hot cycle (and add bleach to any loads which can handle it). Steam clean your carpets and rugs, the hot water and cleaning agents should get rid of those pesky spores. High standards of personal hygiene among the human family members is very important if a family pet has been diagnosed with ringworm. Obviously always wash your hands thoroughly after touching/playing with/grooming your dog if he has Ringworm. If any family member develops circular, reddened, itchy or scaly areas on their skin, it's important to have them examined by a doctor. Prompt treatment will eradicate the infection and prevent it from spreading. However, as with dogs the treatment can take some time to completely eradicate the fungus. My daughter caught ringworm once, after a visit to the local city pound, and was prescribed a topical anti-fungal cream which did, eventually, fix the problem.